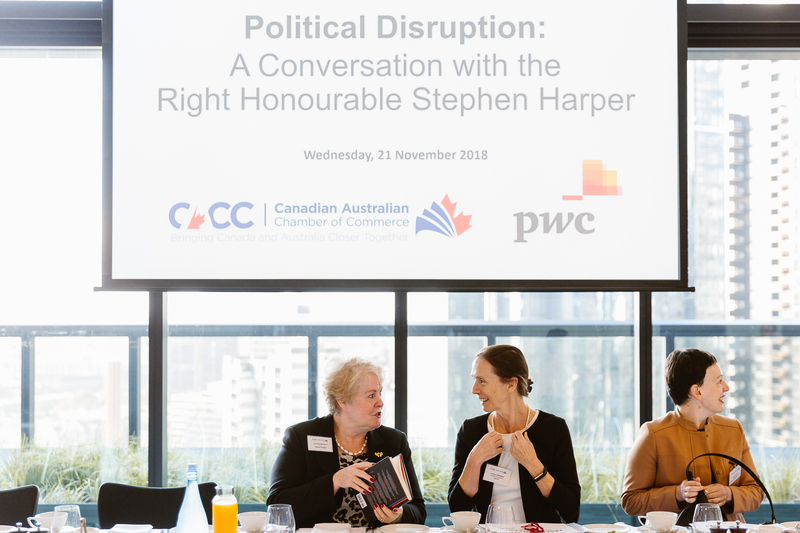 This week the CACC was excited to host The Right Honourable Stephen Harper, Canada’s 22nd Prime Minister, for boardroom briefings in both Sydney and Melbourne as part of a visit to Australia in support of his recently published book ‘Right Here, Right Now: Politics and Leadership in The Age of Disruption’. 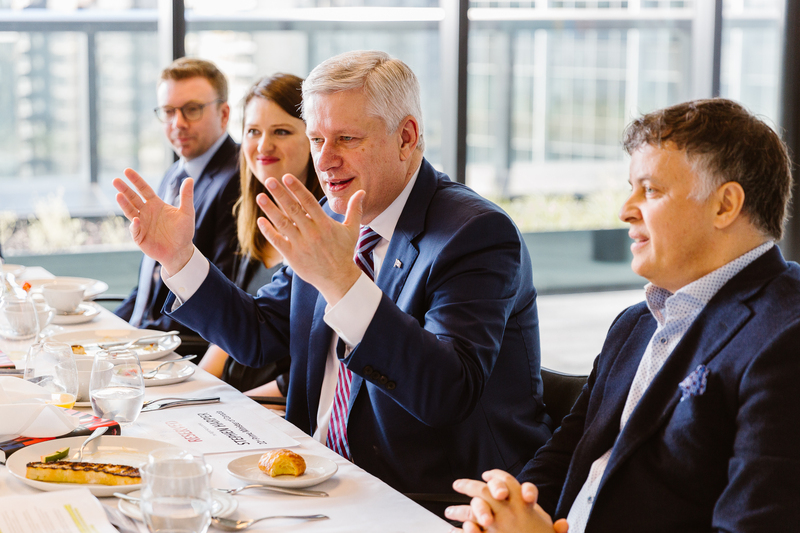 The events, entitled Political Disruption: A Conversation with the Right Honourable Stephen Harper, discussed the current political landscape and the impact this is having on business and trade relationships across the western world. With a political career that included founding Canada’s modern Conservative Party in 2004, followed by three successive national election victories in 2006, 2008, and 2011, Mr Harper’s time as Prime Minister saw Canada sign historic trade deals, undergo significant growth, and cement its standing as a leader within the G7 nations. He reduced federal taxes in Canada to their lowest levels in more than fifty years, created 1.3 million jobs, balanced the budget while making investments in healthcare and infrastructure, attracted new investment and fostered innovation. Despite only three years having passed since Mr Harper left office, the global political landscape has shifted dramatically, driven primarily by the rise of populist movements around the world that have created an atmosphere of uncertainty. “I left office in 2015 and the world went to hell in a handbasket,” Mr Harper jokes. 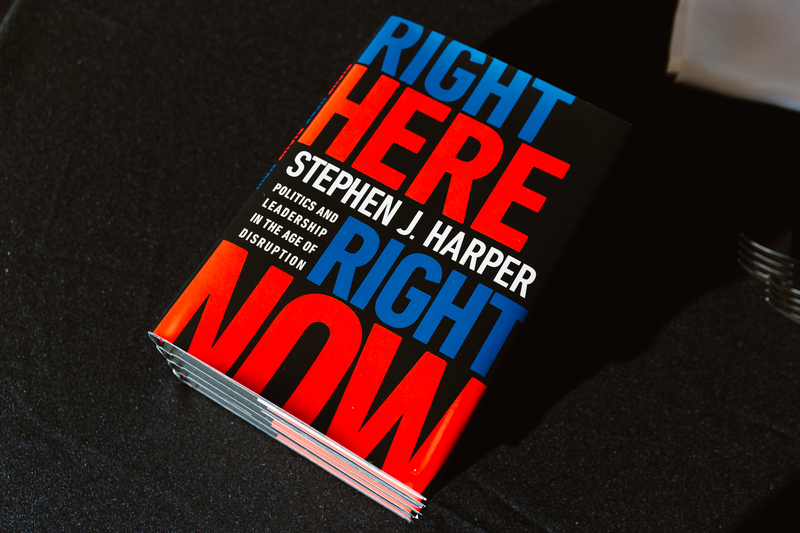 Mr Harper’s book explores why we are seeing phenomenons such as the Brexit referendum, the election of Donald Trump and the rise of new, unorthodox populist parties. 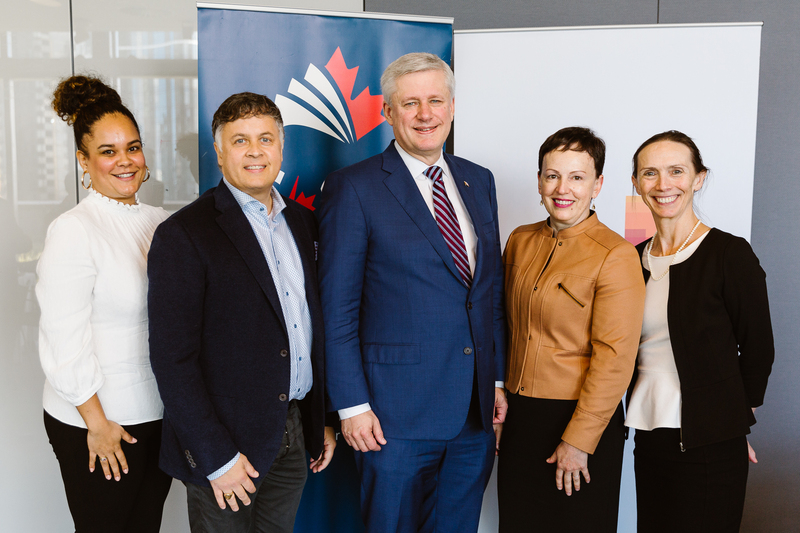 PICTURED (from Left): Melissa Wharton, CEO – CACC, Mike McGrath, Managing Partner – PwC Australia, TRH Stephen Harper, Sophie Galaise, Honourary Member – CACC Melbourne Committee & MD – Melbourne Symphony Orchestra, Lesley Gillespie, CACC Director & Co-Founder Bakers Delight. Mr Harper points to the Global Financial Crisis (GFC) as being responsible for having shifted the political culture in many western countries. “The GFC and the impact of bailing out the wealthy on the political opinions of the middle class, cannot be underestimated,” he said. Mr Harper blames non-inclusive growth, where the wealthy benefit at the expense of the working middle class, as the primary force driving the populist movement. “What is going to surprise you, is that I actually think, objectively speaking, when you look at the complaints of these populist parties in many countries, they are actually right,” Mr Harper said. The solution? It is complex, but in simple terms, involves careful calibration of public policy to insure that globalization and market-based economics are delivering progress for working people. This process will take time but, in Mr Harper’s view, is the best way to restore public trust in the institutions underpinning democracies around the world. Despite the concern surrounding the rise of populist parties, Mr Harper paints a positive picture for the future. He said both Australia and Canada would benefit from having a more “global and entrepreneurial outlook”, particularly in this time of disruption and change. Mr Harper’s career after politics has involved the establishment of consulting firm Harper and Associates, which provides advice about political risk to clients in the financial services, technology and energy sectors. The CACC thanks corporate sponsor PwC for hosting both events, as well as volunteers for their support. 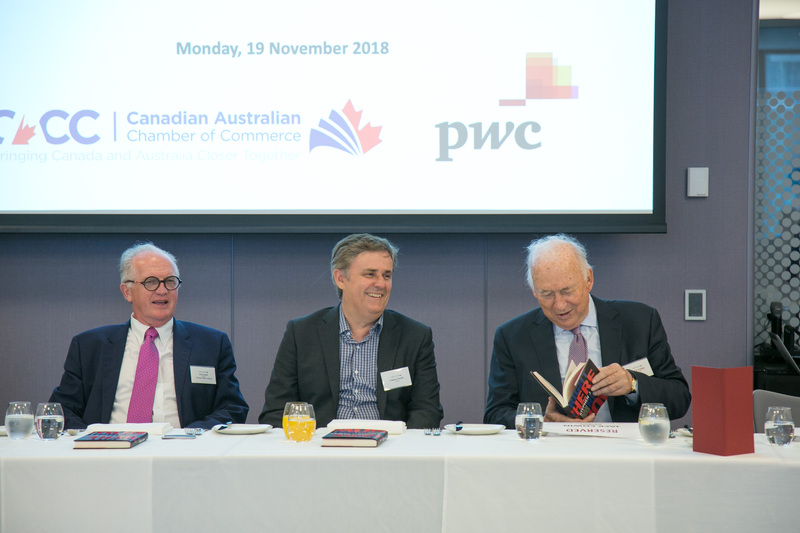 The Canadian Australian Chamber of Commerce (CACC) is a non-profit volunteer based organisation that aims to bring businesses together to facilitate strong economic and trade relationships between Canada and Australia.